What to do in Jamaica ? 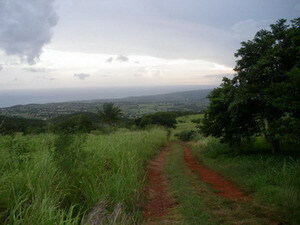 What to do in Jamaica, after you've done the beach? Well, we've got all kind of things happening here in St. Elizabeth. Why not try a Farm Dinner. A what? A Farm Dinner. 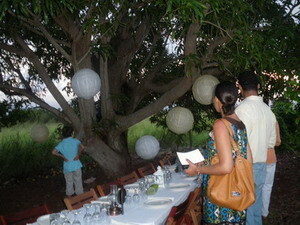 Scrumptious organic dinner, in the middle of a farm, in the middle of St. Bess. Cool. Your hosts for the evening are Mr. McLean (aka Dool, pronounced like "Wool", but with a "D"), on whose farm the dinner is held, and the staff of Jakes Hotel, Treasure Beach. Liz Solms was the conceptualiser and initial organiser. Under the stars, under the mango trees, a long table dressed in white stands waiting for you to enjoy good company and delicious organic food, in a setting that compels you to forget everything but the moment you're in. The outrageous red of the soil is as memorable as the genuine welcome of Maas Dool. 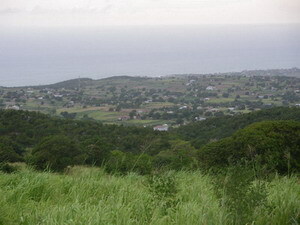 Mr. Mclean's farm is situated on 35 acres of land in Round Hill, above the Pedro Plains, in an area formerly known as Reynolds Run (his late wife was a Reynolds, a popular name in the district). Encouraged by Liz, the veteran farmer has been brave enough to practice organic farming in a community where this natural method had long been abandoned. 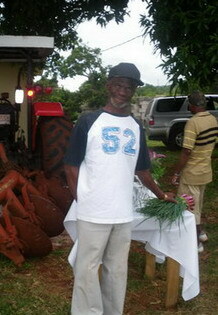 No chemical fertilisers or pesticides are used on his crops, which include skellion, sweet potato and corn. The multiple course meal at the Organic Farm Dinner uses, almost exclusively, crops grown on the farm - healthy, natural and delicious. From my first sip of Mango Bellini, to the Ital Red Peas Soup, through the Ackee Quiche, the Thyme Roasted Chicken - it was all good at my Organic Farm Dinner debut. I never imagined that I'd enjoy Goat Cheese Quiche, but I did. And who would have thought that caramelised oninons would be something to remember? The wine served with all the courses definitely encouraged pure good vibes and niceness among the guests and soon-to-be friends. When you try this for yourself, be prepared to do a lot of laughing! And wear comfortable shoes that can stand up to the red dirt. Since I'm from St. Bess, you might think that being on a farm in my own parish might not hold much charm for me. But guess what? I had such a good time! As for the tourists and city dwellers who were there - for them it was a breath of fresh air, quite literally! Hats off to Liz, Dool and Jake's in Treasure Beach for initiating what's sure to be a continuing success, and an environmentally conscious one too. So if you're wondering what to do in Jamaica for something kinda different, make your way to St. Elizabeth and get in the organic groove. The Pedro Plains are just waiting for you. 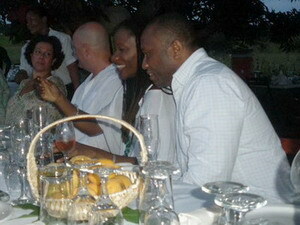 The dinners are held once per month, on the Saturday closest to the full moon. For information and reservations, call Jake's Resorts at 876-965-3000. 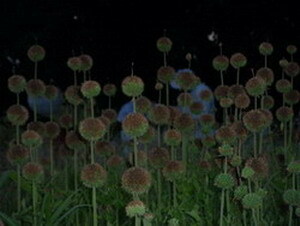 Before you leave, check out this plant that grows on the farm - Alligator Gall (politely known as Globe Thistle). See those white figures in the background? Well, I didn't see them when I took the picture. We country people have our theories! But it's probably just the lighting, right?